When it comes to storing food properly, there are many conventions that some people swear by and others will argue 'til the end of time. Do you store bread in the fridge, freezer or in a bread box? Should you store tomatoes in the fridge or on your countertop? One of the most-discussed foods in the food storage domain is butter. People have long debated whether or not and how long to keep butter out of the refrigerator. Butter straight from the fridge is too hard to spread, and what good is that? As with many culinary debates, there's not really a cut-and-dried answer. According to the USDA, you should store butter in its wrapper in the fridge and keep butter out only for 10 to 15 minutes before using, but some cooks will use butter after leaving it out for a week. Because butter is made from pasteurized milk, the chances of contamination are low, says cooking blog The Kitchn. There's always a risk, however. Salted butter, because of its salt content and water dispersion, runs a lower risk of spoiling and its salt helps keep bacteria away. Anything unsalted, whipped or "light" has a greater risk of contamination. In sum, while we can't recommend you keep butter out all week, you likely don't have to worry if you've left it out for a couple hours, so long as it's salted. While there may not be a definitively right or wrong way to store butter, there are certain foods that are much more straightforward. Some foods never belong in your refrigerator. Storing these foods in the fridge when you shouldn't can zap or alter their flavor, or make them go moldy fast. Why risk losing flavor when all you need to do is store your food correctly? Tomatoes will lose all their flavor in the fridge. What's a bigger crime than that? The cold air in the fridge stops the ripening process, and ripening is what gives tomatoes more flavor. The fridge will also alter the texture of the tomato. According to Harold McGee's 'On Food and Cooking,' the cold temperature breaks down the membranes inside the fruit walls, turning it mealy. Keep tomatoes out in a bowl or basket on the counter. Basil will wilt faster if left in the fridge, and it will also absorb all the smells of the food around it. It's better to keep it out, sitting in a cup of fresh water, like cut flowers. 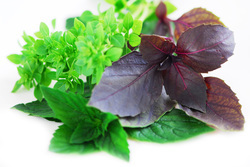 If you want to store basil for a long time, it is recommended to blanch it and then freeze it. Keeping a potato in the cold temperature of your refrigerator will turn its starch into sugar more quickly, so that you'll be left with a sweet, gritty potato. Instead of putting potatoes in the fridge, store them in a paper bag in a cool -- not cold -- place. Assuming you don't have a root cellar -- the ideal place for potatoes -- store them in a dark place, like inside your pantry. Paper bags work better than plastic because they're more breathable and the potato won't rot as fast. 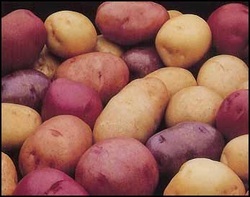 Store potatoes at a temperature as close to 45 degrees as possible. All this goes for sweet potatoes too! 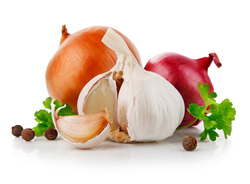 If you put onions in the fridge, the moisture will eventually turn them soft and moldy. Keep them in a cool, dry place. (You can store scallions and chives in the refrigerator, however, because of their higher water content.) Just keep your onions separate from your potatoes; when stored together, both deteriorate faster. Eventually, garlic will start to sprout in the fridge, and it may also get rubbery and moldy. You should instead keep garlic in a cool, dry place. If you want avocados to ripen, definitely don't put them in the refrigerator. However, if you've bought an already-ripe avocado that you don't want to use right away, that can go in the fridge. You refrigerator will dry out your bread quickly. Unless it's sliced sandwich bread that you intend to use within a few days, keep bread out on the counter or in the freezer. You should keep bread that you will eat within four days out, to be sliced when you're ready to eat it, and you should freeze the rest to thaw and eat later. Bread in the freezer should be wrapped so it retains its moisture, and when you remove it from the freezer, you should let it thaw slowly and completely before eating or toasting. If you leave coffee in the refrigerator, it will lose its flavor and actually take on some of the odors in the fridge. You should store coffee in a cool, dark place, where it will retain its flavor and freshness. You can store larger quantities of coffee in the freezer, however.